In today's economic climate, organizations are grasping for ways to improve efficiency and reach higher levels of performance without cutting into budgets. 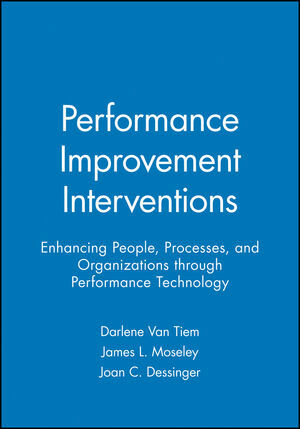 Performance Improvement Interventions: Enhancing People, Processes, and Organizations through Performance Technology is a comprehensive guide to doing more with less. From job analysis, personal development, and communication, to organizational design, human resource management, finance, and more, this book provides salient guidance on real-world solutions based on the International Society for Performance Improvement's Human Performance Technology model. Darlene M. Van Tiem, PhD, CPT, CPLP, is an associate professor emerita at the University of Michigan, Dearborn and faculty member of Capella University. Previously, Van Tiem served as Human Resources Training Director for Ameritech Yellow Pages and Curriculum Manager for General Motors Technical Curriculum. James L. Moseley, EdD, LPC, CHES, CPT, is an associate professor at Wayne State University's College of Education Instructional Technology Program. In addition to teaching, he serves as both an internal and external consultant in program evaluation, performance improvement, and health education.